Yuri Andrukhovych came to Prague’s Forum 2000 more as a journalist from a country very much in the center of debates about political liberties and freedom of the press than as the writer of the postmodern absurdist novel Perverzion. At the forum itself he discussed the situation of Ukraine and its beleaguered yet extremely resilient journalists. At one evening’s event he was joined by fellow Ukrainian writer Mykola Riabchuk and poet Natalka Bilotserkivets for a reading and discussion with Czech writer Radka Denemarková in which he read some of his poetry and I was able to ask him a little bit about any work of his coming out in English translation. Denemarková immediately brought out the discrepancy between the audacity of his novel writing, which she said she finds “playful and arrogant in the good sense of the word” and the more thoughtful, ruminative nature of his essays, which almost seem as if they were written by a different person. Andrukhovych responded that writing, for him, means playing with different masks and being a kind of actor. While being a journalist these days is difficult everywhere this difficulty takes on entirely different dimensions in a country like Ukraine, where listening to Andrukhovych speak, you realize just how high the stakes are for civil society and just how significant a role journalists play there. Even reading his poetry this reality was never far away, as when he read from the poem “Sie Können Den Computer Jetzt Ausschalten” (scroll down for this poem). Andrukhovych introduced the poem by talking about its origins in an e-mail he received in 2003 while in Germany informing him of the death of journalist friend Alexander “Sashko” Kryvenko in a car accident that many considered highly suspicious. The poem’s title refers to the German message that comes up on the screen when you shut off Windows as he did that night, numb and in a state of disbelief. On an earlier panel about state-dominated media he had brought up the infamous case of another courageous journalist, Georgiy Gongadze, whose independent website Ukrayinska Pravda (Ukrainian Truth) was such a thorn in the side of the government that he mysteriously disappeared a few months after its founding in 2000. Eventually, his decapitated corpse was recovered in a forest outside Kyiv. Not surprisingly, no one has been brought to justice in his murder. Andrukhovych says the pressure against the rare independent media voices in Ukraine today remains harsh, with TVi being the sole independent, purely critical television channel left. “They function under total stress and on the edge of survival, with constant tax raids,” he said, adding that their broadcasts have been disabled in certain regions of the country, particularly in the east and south. Being disabled has made it necessary for them to relocate to the internet, with the internet community, Andrukhovych saying, being the most critical segment of society. The move to the internet has led to the emergence of a new profession in the country, internet trolls having become a state-supported profession much like in neighboring Russia. Unlike Russia and Belarus though Ukraine has voiced aspirations to join Europe and even under President Yanukovych hasn’t renounced those aspirations. Andrukhovych said that the current regime was clearly going for much more control than its predecessors but that it wasn’t a dictatorship though it definitely showed dictatorial tendencies, such as having TV stations closed for not being “professional” enough. The parliamentary elections taking place on October 28 “will determine the future behavior of our regime,” Andrukhovych said, adding that they are really only a dress rehearsal for the far more important presidential elections scheduled for 2015. Yet Andrukhovych ended the panel on an optimistic note, referring to the inspiring example of Gongadze’s bravery for journalists and Ukrainian civil society alike. “From 2005-2010 journalists became more powerful and more able to resist and become organized in anti-censorship groups,” he said. He referred to the defeat of an anti-libel/defamation law as the latest example of a victory for free speech. At the other end of the spectrum from politics is rock ‘n’ roll, which Andrukhovych has been involved in through having his poetry put to music by a band called Dead Rooster (Mertvyi piven’). Originally from Lviv, the band put his words to music before they got to know him in the 90s and the writer admits to having always been disappointed by the music they composed. Andrukhovych said that the band Dead Rooster is, in fact, dead, the victim of what he referred to as a “Yoko Ono situation.” Instead, he said he has been working intensively with a Polish band Karbido, for which he sings. There is a fantastic video for their song “Mafia” on YouTube. Their latest project, Absinthe, is connected to Perverzion. Andrukhovych referred to a lost film of the novel of which only the soundtrack – Absinthe – remains. I asked Andrukhovych about his translations into English and couldn’t help getting a sense of disappointment, something which I sense from many writers whose works don’t receive much notice in the English language world while supposedly serious critics go into raptures over the literary mediocrity of the month. The Moscoviad came out in a limited edition and fell off the map. At the moment he said an English-language volume of his essays is being prepared. I have previously linked to articles of his on East Central European culture (PDF) and a darkly funny run up to Euro 2012 so a volume of his non-fiction would definitely be something to look forward to. Still, it would be nice to have more of his novels in English as well, especially considering what fills the bookshelves in its place. For more on Yuri Andrukhovych’s novels in English and otherwise go to the Complete Review for reviews of Perverzion, The Moscoviad, Recreations and Дванадцять обручів among others. 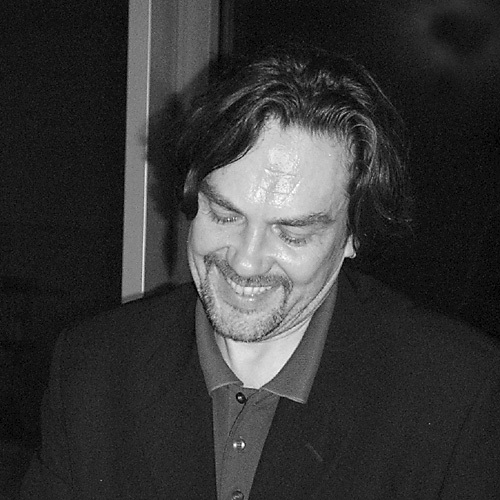 Some of Andrukhovych’s poetry is available online in English translation at sites such as Poetry International, Qarrtsiluni, and 3:AM Magazine. To read an interview with Andrukhovych published on 3:AM click here.